We are already going full steam with organizing the venue for DevOpsDays in Riga, but there are a lot of other places where there is much to learn from! 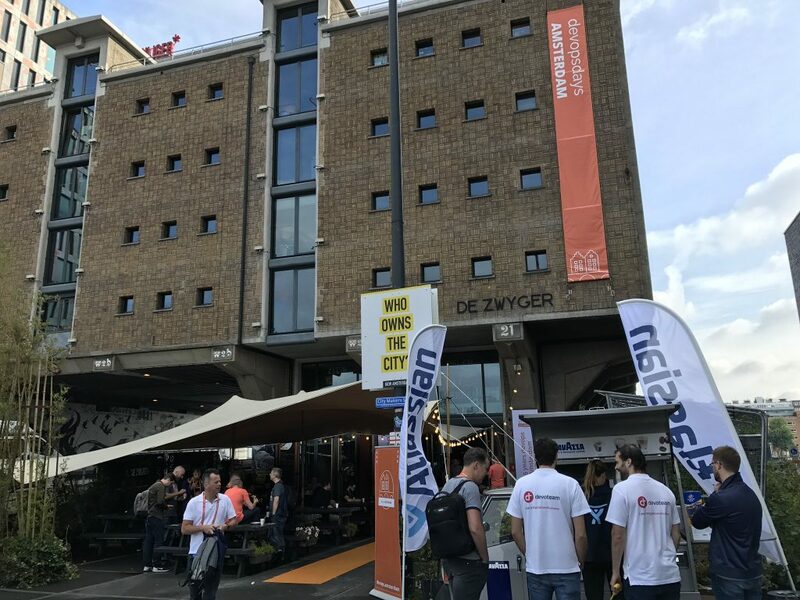 Last month, two of Riga event organizers, Uldis and Edgars, went on a trip to check out how DevOpsDays is done in Amsterdam! They returned to us with a lot of takeaways. They were both eager to share their experience. Tell us shortly, what happened there? Edgars: There was a bit non-typical agenda for me since I have never been to Ignite talks and Open Space format. The first half of day was with classic talk in length of 30min, then after lunch was 4-5 Ignite talks, each for 5min in a high tempo, where speakers were sharing their story or main idea. I enjoyed Ignite format since it allows me in short time to get to know those 4-5 speakers and main idea and if I was interested then I could go later and talk with them some more. In the second part of the day, there were 2 kinds of tracks – one in classic talk way, the second was Open Space. At Open Space opening session people come up with different issues they would like to talk about, and then visitors vote for those issues and organizers decide which issues will be in Open Space and set rooms for them. What at first felt scary about Open Space – how it will work if nobody is moderating every specific Open Space. But it worked very well and many people enjoyed the possibility to talk with others about different questions they had. Approximately half of visitors were attending Open Space and the other half stayed on a parallel track. Uldis: The event took two days, where the mornings usually began with some keynote. 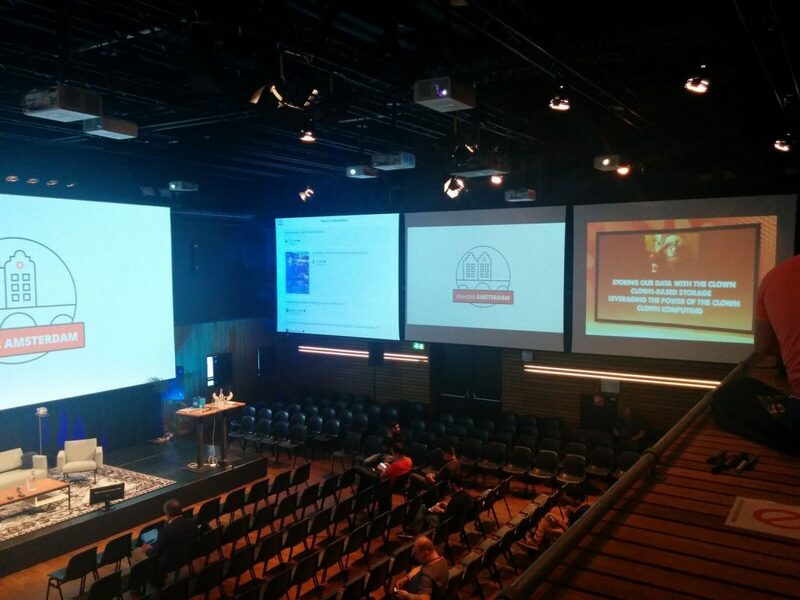 That was in the biggest room, which was indeed big – with around 400 people in it, with screens all around. Then, the best speakers were giving talks on various, as usual lately, rather non-technical topics. Now a popular one seems to be, how they call it, HumanOps, which was covered quite a lot. There many topics related to psychology, and “team-growing” practices, a lot about communication and collaboration. All the latest and greatest topics were about these. After one or two such topics the crowd split into separate smaller rooms, usually around a hundred people per room. There the stuff got more specific, and sometimes more technology-oriented, but overall, very little of that. Most of it was, again, HumanOps topics, and various practices related to software engineering. In the afternoon, there were Open Spaces. Meaning, the people gather sitting in a circle, and there is some selected topic to talk about. This Open Space is not even really led by anybody – people just begin talking about related stuff they’re worried about, or interested in, which they want to share, or gather knowledge on. So it goes on like that for about 45 minutes. The one I took part in, really worked. What was your highlight of the speeches? 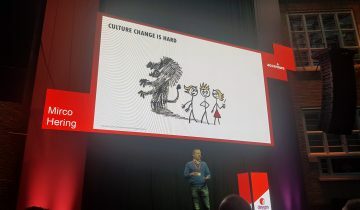 Edgars: Conference wasn’t very technical it was mostly about DevOps values and principles. Uldis: I believe that it was the very first one, from Katherine [Daniels], who was one of the keynote speakers, and she was talking specifically about burnouts – about new researches on how people burn out, and what are the reasons for that, that it is not as black-and-white as it is usually perceived by the society. She told about how she, with another lady, had made her research, she herself is a DevOps guru and knows that the human topics are important as well. So her presentation was a bit eye-opening, with new information, a good speaker. She also displayed her knowledge on human behaviour, on responsibility, in the discussion section after her talk. What was the highlight of the whole event for you, apart from the speeches? Edgars: There were close to 500 visitors. A big focus was on facilitating communication between attendees through Open Spaces, pre-party, party. A lot of food, a lot of BBQ. A lot of fun. Uldis: A happening from the Open Spaces comes to my mind – where one of the topics picked was about Agile practices which sometimes do not even work on real projects, and how to deal with it, and what it means. Because the Agile practice in itself is a part of DevOps basics, which we could not do without. But the Open Space itself, the forty-five-minute discussion, ended up with a discussion about the good and bad practices of standups. That was something people really wanted to talk about, and they forgot what the conversation even began with. A very active discussion of where and how stand-ups are done, the problems with what to do if people are in different locations and countries, who uses video, and who doesn’t, what tools are used, etc, and a really active discussion with some 25 people in it. This is a good example where Open Spaces can go seemingly astray, while at the same time being of use to the people looking for some answers. What surprised you, what was unexpected there? Edgars: How friendly all of the organizers were, and how well they collaborated (they are very good, self-organising team). How many people were at DevOpsDays Ams for the first time. How many people participated in Open Space. Uldis: I guess it’s hard to surprise me. There wasn’t anything that’d sweep me off my feet. There was generally a good, professional feeling about this. That the event is well worked-through and made by people with experience. The surprise to me was, that they had not only indoors – they also had a venue outdoors where you could sit on benches in open air. 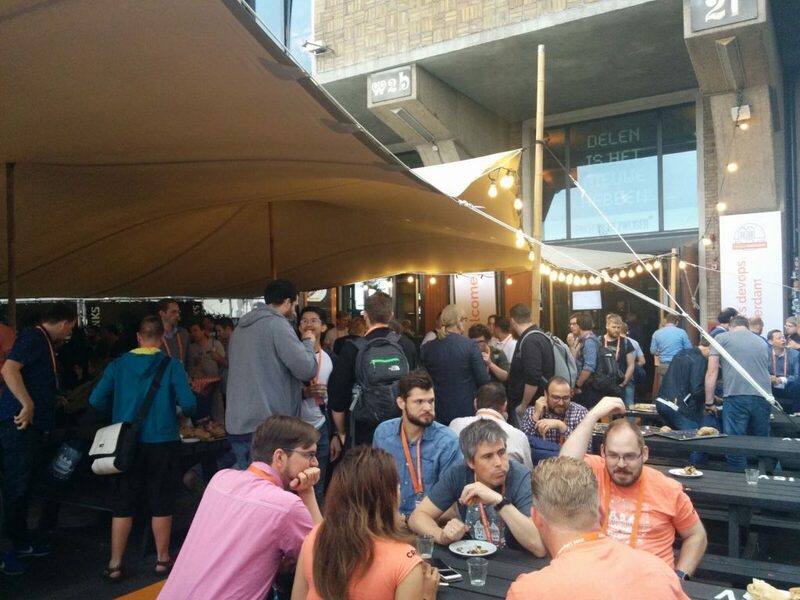 There were some sponsors providing treats – for example, Atlassian was giving out coffee, you could also get some lunch outside. That makes the atmosphere fresher, lighter, and more pleasant – there is more fresh air – that was something a little new. When approaching the venue, there was a huge banner outside, saying “DevOpsDays Amsterdam Here”, which made the first impression, that – hey, yes, I know, this is where I’m going to, and it is a serious event. What is your most valuable takeaway from the event? 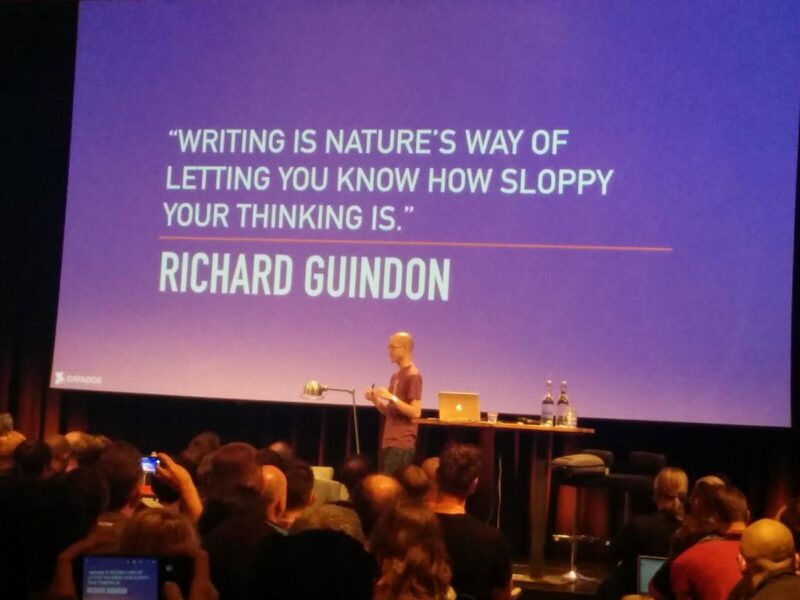 Uldis: As DevOpsDays Riga organizer I have a clear goal – learning from their live practice. So there were a lot of little things that would be my takeaways – how they use Twitter, how they organize stuff. I’m particularly interested in how they gather topics for the Open Spaces, which I saw in action, and that it indeed works, even with the shy engineers. The very open and simple communication with people was something that caught my attention. Who was the most impressive person you met? 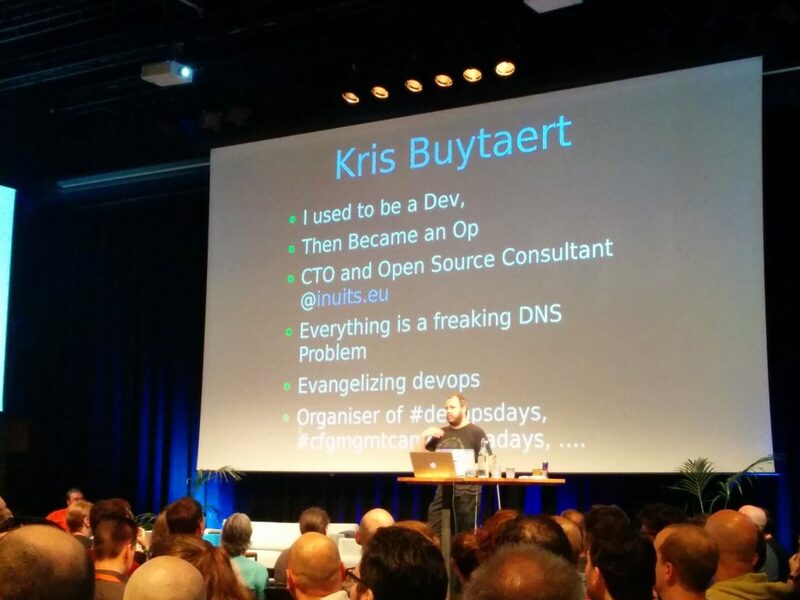 Edgars: Kris Buytaert – one of DevOpsDays fathers. He was very involved in many organizational tasks however he wasn’t the main organizer of DOD Ams. He knows most of the speakers and very many from industry. Uldis: To me personally it was important to meet Kris who is one of the DevOpsDays fathers, so to say. In Amsterdam, it was their fifth time organizing this event, but he has done it in multiple European countries, helped begin and continue this in the USA. Getting to know him, and his experience was quite an important point for me. There also were several people whom I’d really like to see in Riga, whose names I don’t particularly remember right now, but people who seem to know what they are talking about and have the hands-on experience. Engineers, but interested in a lot more than that. What was different from the other related events you have visited? 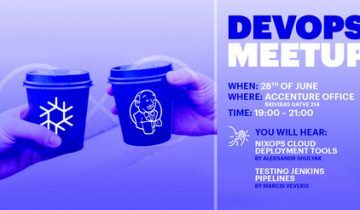 Uldis: DevOps in itself definitely – if the current modern conferences usually have a separate DevOps track, for people who want to choose to know more about it, then this conference is solely dedicated to this topic. This is not some field in IT, like Testing conference, for example, no. This is a new way to lead and organize software engineering projects, so it applies to everyone. 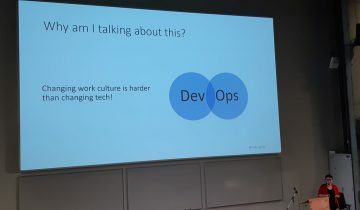 The people who come here know very specifically what they are going to receive – that it is DevOps. And these Open Spaces are definitely something unique. In Latvia, as I heard very recently, this is also the first year for Agile Days Riga. Unfortunately, I didn’t take part in organizing that, thus I didn’t see how they’re doing it, but after discussions with the organizers, I understood that, what they plan, is something very similar. Something which is not just to come to listen and look at slides, but to receive unique experience from this local area, and not from somewhere far away, like the US, which might as well not play here at all. This is something I have never seen in other conferences. What from all you saw in Amsterdam you would like to see in Riga event? Uldis: What I want to see – definitely a few particular speakers from there, for example, Katherine, there were at least two more with a similar impression. I liked the arrangement of the room itself, how people were sitting around the stage – not in front of it as usual, but on the sides as well. A pleasant feeling of unity. That simplicity, and professionalism, at the same time. It felt good to be there with people. 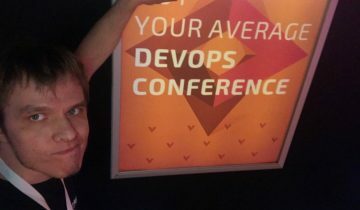 Thanks to Uldis and Edgars for sharing their experience attending DevOps Days Amsterdam! In Riga event, we will adopt some of the good practices seen in Amsterdam. Starting from formats as Ignite talks and Open Spaces to the positive vibe and valuable content to make DevOpsDays Riga 2017 a place for IT professionals interested in DevOps to meet, learn and get inspired. Join our Facebook event page to be updated about latest announcements, as first speakers are already confirmed, and see you in Tallink Hotel Riga on SEP 18-19!